We actually have blue skies with white puffy clouds this morning. However, I expect that will change shortly. South Florida is in its typical summer weather pattern of heat and afternoon thunderstorms. That is a good reason to stay inside and create. 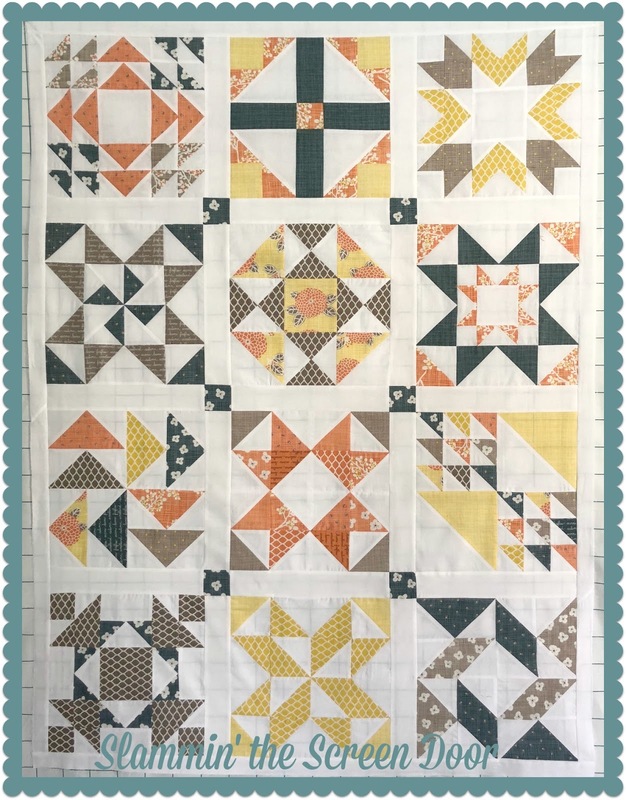 I had participated in Sherry’s A Quilting Life Block of the Month last year. The fabric I used was a fat eighth bundle and part of a layer cake of Autumn Woods by Kate & Birdie for Moda. 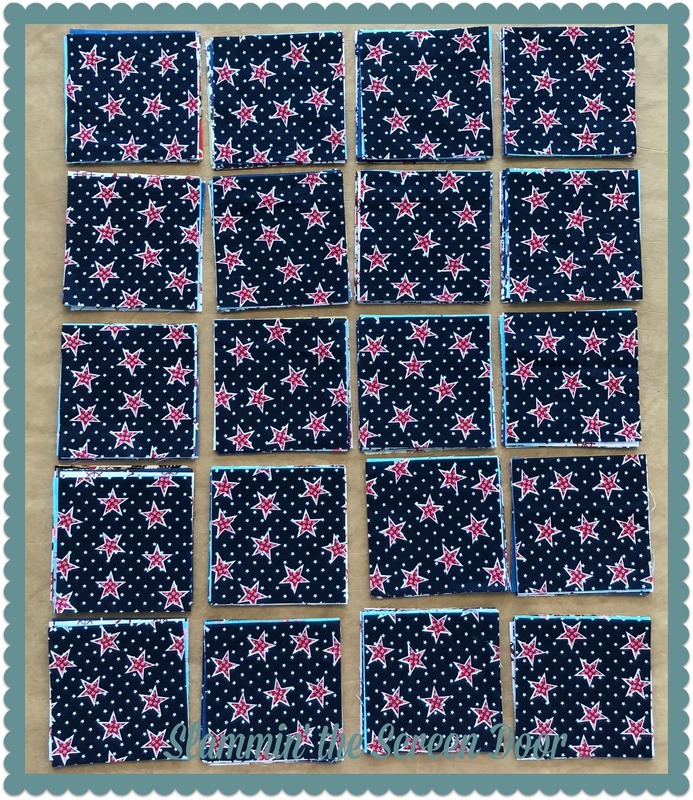 This fabric is no longer offered (anywhere I’ve found) so this is as far as I’ve gotten. I’ll just look for something that will coordinate and hope it works. 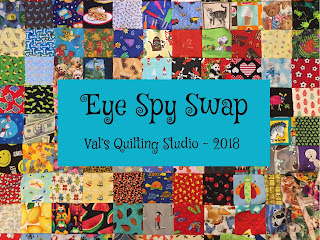 Val who blogs at Val’s Quilting Studio is hosting a fun Eye-Spy Swap. I watched from the sidelines last summer but decided to join this year. You can read all about the swap, including instructions here. She has a few spots left open so why don’t you consider joining us? 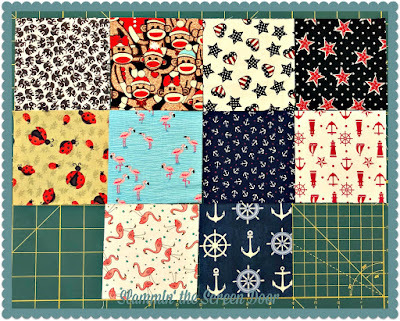 The fabrics I selected were from my stash…yay! They are stacked, packaged and ready to go in the mail today. Val has opened a Flikr group for those playing along. 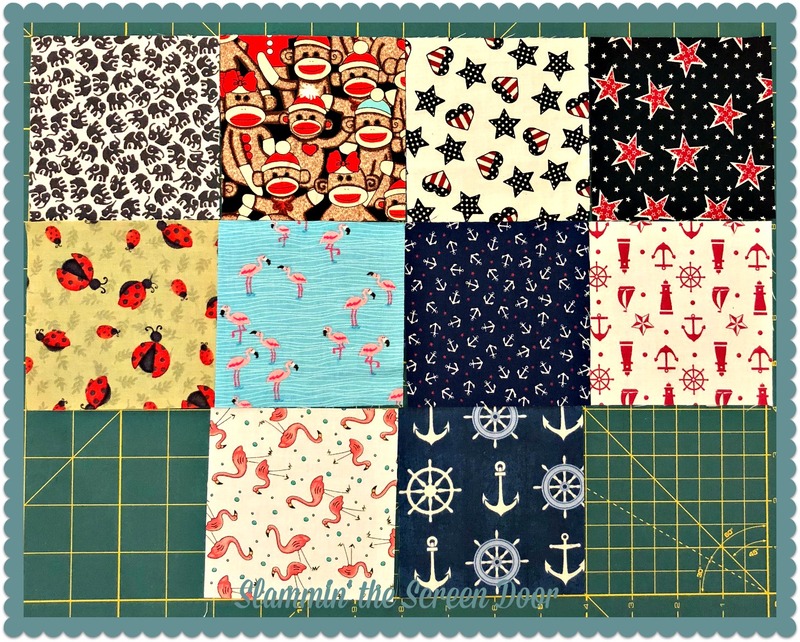 There are so many cute fabrics that I’m sure we are all going to have some fun eye-spy quilts soon. 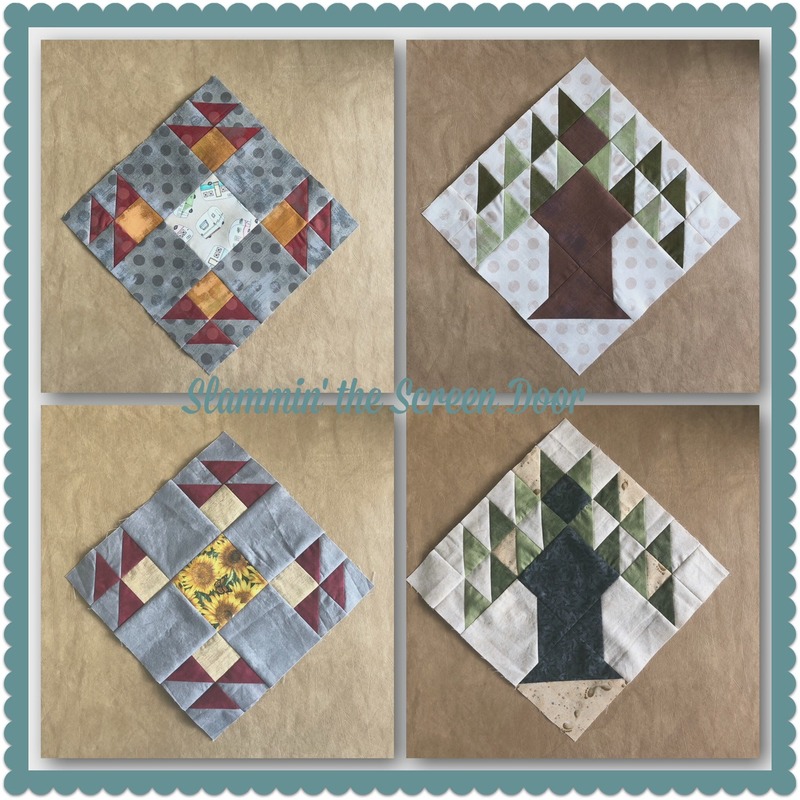 My friend Kelly and I spent last Saturday sewing our May and June blocks for Pat Sloan’s Let’sGo Camping Block of the Month. My blocks are on top and hers on the bottom. 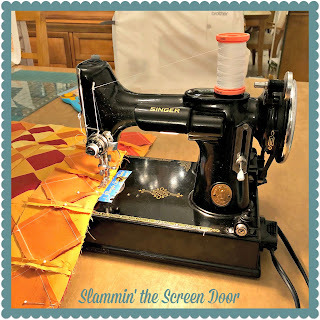 Speaking of friends…I joined Cheryll, from Gone Stitchin’, for her Friday Night with Friends virtual get together. It’s a night of crafting - whatever you enjoy doing. You link up over the weekend and then visit others to see how they spent their Friday night. We are off to run a few errands and then as long as there isn’t any lightening this afternoon I’ll be sewing. What will you be doing? Hope is it enjoyable whatever it is! You still can find some Autumn Woods fabrics on etsy if you search for 'Moda Autumn Woods'. 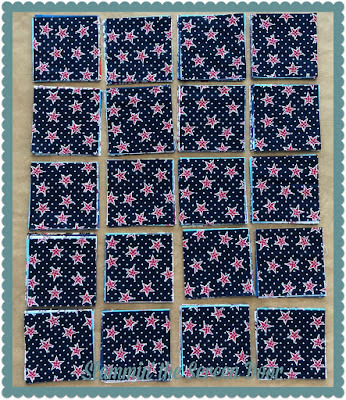 I sent you an e-mail about some shops with the Kate & Birdie Fabric. Maybe you will find something. You've got a lot of great things going on. It's amazing how the temperature quilt looks with all those reds and oranges together. I'm sure you had more rain this afternoon. We did here in Pembroke Pines. Hope the knee continues to improve. I hope you can locate some fabric for that beautiful top. Your temp quilt is looking HOT. I’m still waiting for more reds in mine. You must be going crazy with your limitations. I know I would. Glad that all is going well. You have some wonderful ongoing projects! Eye Spy projects can be fun to sew up. Happy you are healing up and doing better ! Some knee/leg injuries just take a while to heal. When I had knee replacement had to learn patience. Dr keeps talking #2 but I will put off as long as I can! I'm poppin gover from FNWF - you have certainly worked on a lot of thing this week. Hope the recovery goes well - keep up the exercises! 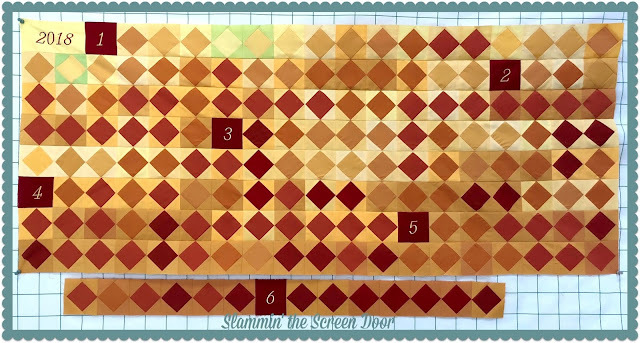 I love the idea of the temperature quilt- I have seen a scarf based on the same idea. glad you are recovering well. I hear you about the cabin fever! your temperature quilt looks fun. hope you find fabric to finish that pretty quilt. At least you are still able to sew, which is a good thing. Glad to hear the surgery went well. I am sure it is bugging the daylights out of you not to be able to do all you were doing before. That thing about being tied down-we are not used to that. For me if DH takes my vehicle-I might not have anywhere I needed to go but still feel confined without the freedom to do so. Visiting form FnwFs. Nice to have you join in. Your are very busy working on many projects..
Hope the knee is completely healed soon. Busy busy!!! Enjoy sewing and since you aren't driving you will get a lot done. oooh, your temp quilt looks very warm! Love your sampler :) Hope you recover soon! Nice to visit you from FNWF. You have plenty of lovely projects happening, and the swap sounds like a fun idea. Your tempertature quilt does look very warm - I need to get moving on mine, I have been collecting the fabrics and have the temperatures noted - just need some extra sewing time! 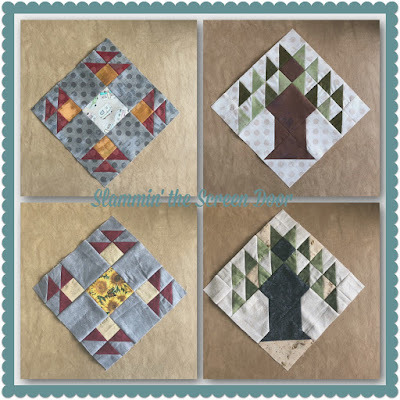 Hello - I saw your comment on Julirose's blog that you were doing a temperature quilt. I would like to invite you to join my weekly Wednesday Weather Report. While most of us are doing EPP, I am trying to get more people to join in with what ever their favorite quilting method is. Hope you'll considering linking up! !